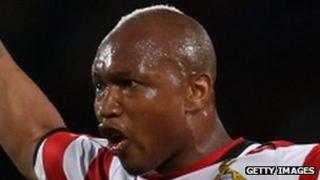 Footballer El Hadji Diouf will not face charges over a disturbance at a Manchester club which left a man seriously hurt. The Senegalese forward was arrested along with five others in April after police received reports of a fight at the Circle Club in the city centre. Following all six answering bail, three of the men arrested have been charged with affray. Mr Diouf, 31, and two others were released without charge. The 33-year-old man who sustained wounds to his head and neck in the attack has since recovered from his injuries. During his 10 years in English football, the Senegalese star has played for Liverpool, Bolton, Sunderland, Blackburn and Doncaster.